A wide variety of baseball bats is offered by various manufacturers. Some of these are created for younger players are different levels of the sport, while others are for more senior players. For this reason, the bats are categorized separately which makes it easier for you to identify which bat is right for you or your young one. 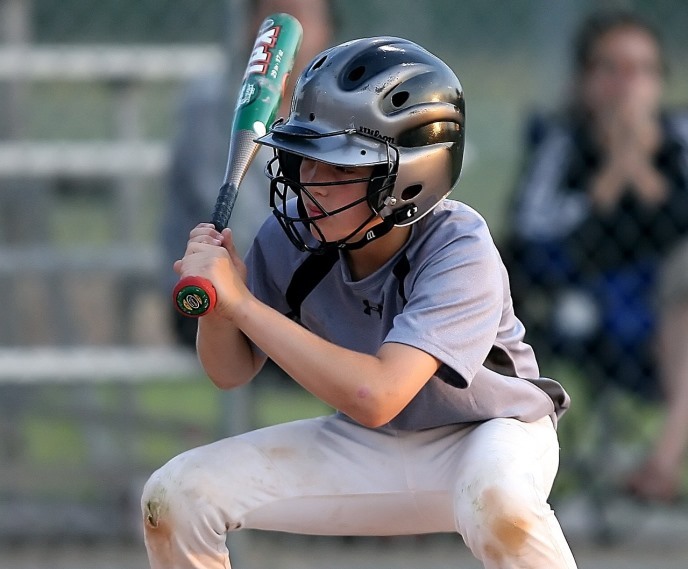 Senior League Bats and Youth Baseball Bats are two categories that feature bats for younger baseball players. The major difference between the two categories is this: Senior League bats have a bigger barrel while youth bats have a smaller barrel. This is precisely why Senior League bats are also known as Youth Big Barrel bats. That being said, there are also a number of other differences that stand apart the two categories of bats. It is important to understand these differences before you buy a bat for your young one. Getting the right bat will let the player swing it more naturally and deliver a more effective performance. Getting the wrong bat, on the other hand, might bar him or her from playing in a league that has strict rules. Without further ado, here are some of the notable differences between the two bat varieties. Youth baseball bats as well as Senior League bats are required to follow strict length regulations. In the case of youth bats, the length restriction is 36 inches. They may be shorter than 36 inches but they must not exceed beyond this limit. As a general rule, this also applies to Senior League bats. However, Senior League bats typically fall in the 25 inches to 33 inches range. This makes them typically shorter than the youth baseball bats, but with a larger diameter. This is probably because youth bats are meant to make it easier for younger players to hit. In contrast, Senior League bats are a step up and make it slightly harder to hit by forcing players to be more accurate and precise. It is important to note here that there are no hard and fast rules that distinguish the weight requirements for these bat varieties. However, there is the general practice. In general, Senior League bats will weigh from 14 to 28 ounces. Youth bats, on the other hand, do not have a hard and fast weight range. In both cases, the right bat weight is correlated to the height and weight of the player. The taller and heavier a player is, the more likely it is that a heavier bat will be the right choice. Similarly, a shorter or more light-weight player will benefit from a light-weight bat. This is where the two categories of bats differ most notably. The regular youth baseball bats come with a barrel diameter of 2 1/4 inches. Some leagues stipulate that this limit must be followed, not allowing bats with a larger diameter. 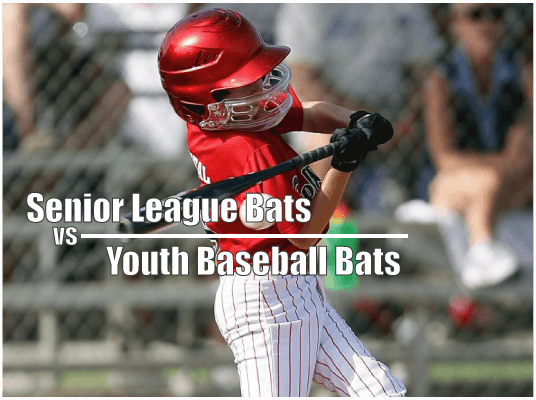 Other leagues allow youth bats with a larger barrel, in other words the Senior League bats. Senior League bats, or the Youth Big Barrel bats, come with a barrel diameter of 2 5/8 inches or 2 3/4 inches. The bigger barrel offered in the Senior league bats translates into greater hitting power for the players. This is important as the players progress in their skill, age and game level. The youth baseball bats have smaller barrels simply because for the younger players, a light-weight bat with a good and easy swing is more important. Smaller barrels enable this by diminishing the overall weight of the bat. 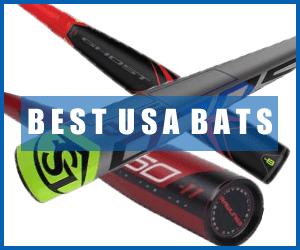 When you review Senior league bats and youth baseball, you will see a considerable difference between their range of length and weight options. This difference also results in a difference in weight drop. Weight drop is the length-to-weight ratio of a bat. The lower the weight drop is, the heavier the bat is going to be. At the same time, higher weight drop translates to more light-weight bats. Youth baseball bats usually have a higher weight drop compared to Senior league bats. Senior League bats have a weight drop range of -5 to -12. Youth bats, in contrast, have a weight drop of -10 to -13.5. Younger players who need more light-weight options should ideally go with the higher weight-drop options of the youth bats. On the other hand, players who can swing powerfully or need a heavier bat to complement their own height or weight should ideally prefer the big-barreled and heavier Senior League bats. Senior league bats are a transition between youth bats and BBCOR bats. Youth bats are light-weight, easy to swing and carry a medium barrel. So these bats are not focused so much on the swing power as they are on the swing speed and the mechanics of hitting. At the early stage, players need to focus on the basics and master them before caring too much about hitting hard. Senior league bats offer a gradual move from lighter bats to heavier bats. As the player is able to master basic hitting and becomes comfortable in using a lighter bat, it is time to give him or her a heavier bat. This progression from -13 to -10 in youth bats and onwards to -5 is important. It shows that the player is progressing and is comfortable using heavier bats as he or she grows in skill and age. It is also important because BBCOR bats are the standard for high-school baseball. And these bats have a weight drop of -3, which means that they are considerably heavier than youth bats. A transition directly from youth bats to BBCOR bats will simply not work. This is why Senior league bats offer a buffer between the two bat varieties. As younger players master the big-barrel hitting of the Senior League bats, they are physically and mentally prepared to take on the more challenging BBCOR bats once they reach the high school. Transitioning across these varieties must be gradual so that players are well-prepared and ready. Top 7 Benefits of Baseball Camp and How to choose the right Camp? Pinetarpress.com is a participant in the Amazon Services LLC Associates Program, an affiliate advertising program designed to provide a means for sites to earn advertising fees by advertising and linking to Amazon.com. Amazon and the Amazon logo are trademarks of Amazon.com, Inc. or its affiliates. Copyright © 2018 pinetarpress.com, All Rights Reserved.